Hello, I’m Sakagami, the general producer. 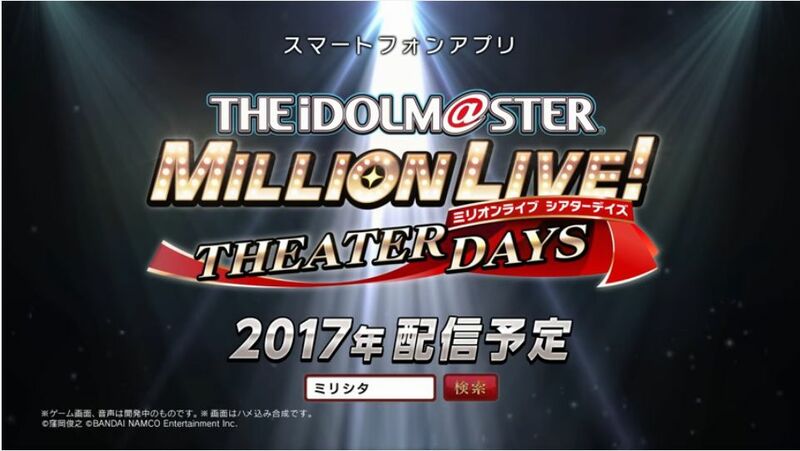 We’ve made you wait, but The IDOLM@STER Million Live Theater Days is now out on App Store and Google Play. The game was announced during the Budokan live, and now all producers can finally play it. I’m relieved we managed to release it for now. Some of you producers have probably played the game already, but the members of the project went through all kinds of trial and error to develop this game, that is set in the 765 Pro Live Theater, while adding 2 extra new idols, to let you interact with the hearts of the 52 765 Million All Stars idols. This time around you are the producer of the idols gathered in this theater, so aim to make them top idols! You’ll be able to look at the daily activities of the idols in game, enjoy the lives and also interact with them in the theater. I hope you can get closer with each one of them. This game is a game that current Million Live producers and also new producers will enjoy. Their idol activities have just started, and I believe that lots of thing will happen from now on. But don’t forget that your producing goal is to turn your idols into Top Idols! One more thing: Tanaka Kotoha will join the 765 Pro Live Theater late. Right now you cannot produce her just yet, but please be patient and wait for her return. It’d be great if you can watch over her. Please enjoy The IDOLM@STER Million Live! Theater Days!